While we have most definitely moved away from our unschooling roots (that never really seemed to take root in our homeschool!). I still like to try and keep learning as hands on and as interesting as possible. I have found that my kids learn best when we take what we've read about and build upon it. 1. Field trips! We all LOVE field trips and I am continually on the lookout for new places that we can go and explore together. In the meantime we keep visiting some of our old favorites whenever we want to take a break from our books. 2. An art project-- my boys don't always enjoy getting messy with art but every now and then we try a new project that they just LOVE. That's why I never stop trying to get them to do art with me. 3. Watching YouTube videos or a movie-- while my kids not always pay as close attention to my reading or a book they are reading they will sit and watch movies and videos any day. I know they are listening and watching too because they are often eager to share what they have learned with other. 4. Science experiments that bring those concepts to life-- I have heard from lots of moms and students that science is hard to teach and it's boring.. but it's wonderful if you incorporate lots of hands on experiments! We're currently working our way through 100 days of art and are having a great time learning art in a more hands on way. 5. Building something (think 3-d maps or models of just about anything)-- We've made brides out of Lego's, cell models out of food, salt dough maps, play dough houses from around the world, and the list goes on and on. Having kids construct what they are learning about helps cement what they have learned with something they have made with their own hands. Learning doesn't get more personal than that. 6. Games!-- Both video and board games are great ways to engage middle school students in learning. My kids have recreated things like Percy Jackson's ship or a medieval castle in Minecraft. We've played the complex chemistry game Ion, and we have two full closets full of games that we enjoy playing. 7. 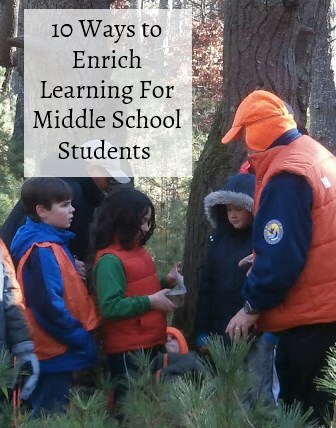 Traveling-- This is my personal favorite way to enrich learning for any students. I just love any excuse to travel! But seriously, kids learn so much through travel. We often visit new museums, historical places, and even just try out new foods my kids otherwise would turn their noses up. Visiting a new place is a great way to bring what you are learning about to life. We happened to be visiting Nashville, Tenn. when we were reading the Percy Jackson series and the boys insisted we stop to see the Parthenon. 8. Take something apart to see how it works-- much like building there is a lot that can be learned through deconstruction. When our VCR dies or any household gadget that we can not fix (or it would just be cheaper to replace) we give the boys the option of taking it apart to see how it works. These things are just going to end up in the trash anyway so why not let them see what's inside? Usually just a few simple tools are needed and they learn so much. 9. Take a class-- We have taken some truly phenomenal classes together. The boys have sit on a college lecture about plate tectonics where they were encouraged to use a computer to follow along, we've taken painting classes, our local children's museum offered hands on engineering classes, we've taken an oceanography class where we went out on a real ocean research vessel. There are some truly great classes out there offered and geared towards homeschooling families and we've found that most of them are taught by enthusiastic instructors who really know their stuff. 10. Cook up something in the kitchen-- Learning about a new geographical region? Whip up a recipe native to where you are learning. Learning about a time in history? Make a meal using ingredients of that time period. Learning about fractions? Pull out a family recipe and have your kids double it! Learning about science? Research how different "chemicals" react and bake a cake. The possibilities are endless and as a bonus you're also teaching valuable life skills. My boys enjoy helping out in the kitchen and I look for ways to bring that into our traditional school day. What are some ways you like to bring lessons to life? These are all great ideas!!! Love your blog and my nieces and nephews always enjoy the activities! Right?! We just love science!! But I seem to be in the minority; most homeschooling families love teaching history and avoid science... I'd teach science over history any day! Awesome ideas!!! You are so creative.